Plasform brochure revitalised to meet latest style and functionality standards. 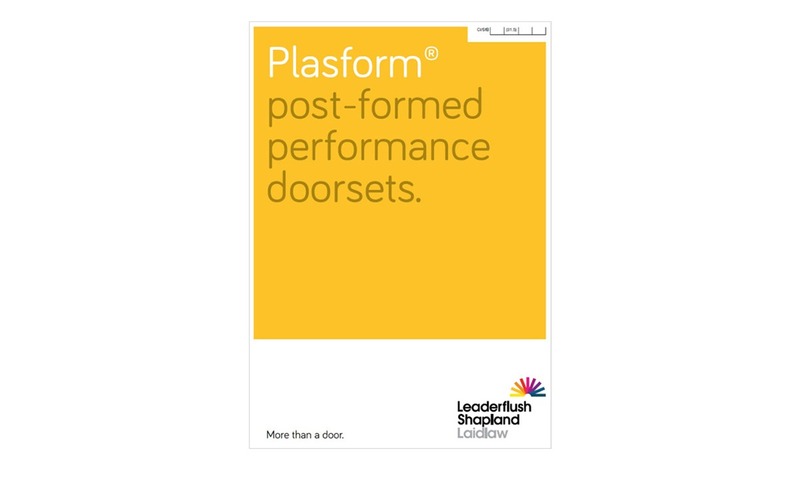 The Plasform doorset offers many unique benefits on design and performance with its ‘softer’ postformed radiused edges, choice of facings, certified performance, anti-bacterial properties and low maintenance requirements. This new Plasform brochure presents a huge range of postformed laminate finish options for a truly distinctive appearance on doorsets. Hygieniform PVC is available in 15 colours and incorporates the revolutionary anti-bacterial additive Hygienilac – killing 99.9% of bacteria to provide vital protection against the spread of infections. PVC free Hygieniform Eco is also available; the environmentally friendly laminate is 100% recyclable and contains no harmful chemicals. Our unique patented facing option Envision opens up new opportunities for architects to create truly exclusive designs where a whole range of visual effects can be back printed onto a transparent facing material on the doorset. The brochure also showcases some of the latest and truly unique case studies on Envision doorsets such as Ockendon Manor’s forest photographic images and Michael Wood leisure centre’s graphical illustrations. As well as offering a unique appearance the Plasform doorset maximises on performance with up to 120 minutes fire and smoke resistance as well as acoustic levels of up to 38RwdB. The Plasform doorset can now be supplied as a complete integrated doorset solution. This concept incorporates all the components that make up a doorset such as the door leaf, frame and architectural ironmongery – meaning that the door works together a unified product to meet the highest performance standards. The integrated doorset blends style with functionality and means the components have been carefully selected and fully tested to provide a co-ordinated, fit for purpose, certified package, offering comprehensive product performance and life cycle resilience. Stephen Hutsby, Head of Marketing and Product Development said “The Plasform, postformed doorset is truly unique and allows designers to create individual bespoke doorsets whilst providing the most elite performance criteria including fire, smoke, acoustic, radiation, severe duty,impact resistance and anti-bacterial properties”.